Corona Contracts design and manufacture bespoke, large format cinema curtains and stage curtains for event spaces and venues. Having been contracting for over 20 years, our customers value our high performance products, which are always designed to their individual specifications. We design, manufacture and install everything we make to ensure that our products meet the highest standards of quality. Our custom manifestations always fit perfectly to the spaces they’re created for and are built to stand up to decades of commercial use. In our 20 years of contracting we have had the pleasure of working with some stunning entertainment venues. We’ve designed and produced cinema curtains for a variety of different entertainment spaces. 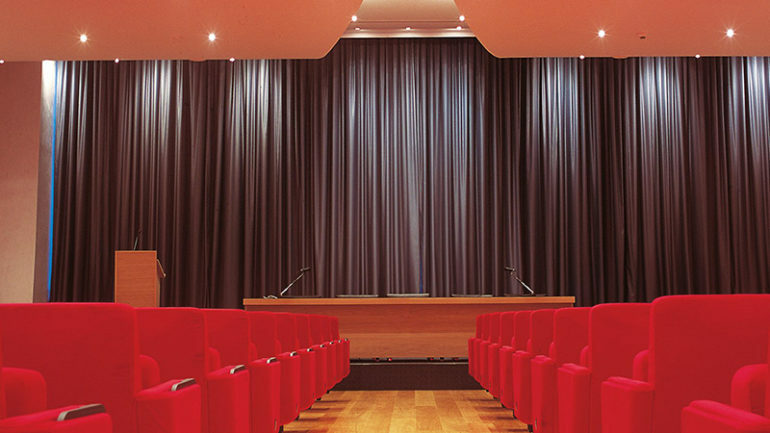 All installations are unique, but all cinema curtains require an extremely high quality construction and a number of specific technical features. Cinema curtains from Corona Contracts are always built to perform and always look the part, contributing a premium feel to any viewing room. We achieve a premium feel in all of our cinema curtains by using carefully selected top quality fabrics. We are able to select from a number of options depending on the look and feel desired for the project. These fabrics are assembled and finished by hand by our in-house team, resulting in a truly professional finish. All seams and borders are expertly pieced together and checked to ensure the final cinema curtains will perform without compromise. We are able to fabricate extremely large panel sizes and drop lengths to the exact specification of a cinema space. Where a room has an unusual shape or presents some unique challenges, we are able to adjust our process to find the best solution. A variety of colour options are available to ensure the curtains match the look and feel of their setting. Our cinema curtains are made to fit our commercial grade curtain track systems, which provide years and years of reliable performance. Our smooth and silent tracks are ideal for preserving the ambience of a theatre or cinema space. For many years we have installed custom motorised curtain track systems for our clients. These are the perfect pairing for our cinema curtains. Using only the highest quality components from Italian manufacturer Mottura means our motorised systems offer thousands of hours of flawless performance. Options include automated and remote control operation, always with a manual backup in case of power failure. Cinema curtains from Corona Contracts can be lined to with layers of thick, technical fabric which deadens sound reflections in large rooms. By controlling sonic reflections, our curtains help audiences hear greater clarity in sound which can otherwise bounce around in big rooms and spaces. They don’t just have to be used on stage either, they can line the sides of a room if required to achieve even greater levels of sound damping. If you would like to learn more about our process, please reach out to the team today for more information. We can work with you to find a solution on any budget, without compromise on quality. We can replace an existing system within a venue, offer advice on practical modifications and features or simply take a specification directly from an architect or designer.